explores the clash of East and West through the lives of three Turkish women - a dancer, an artist, and activist – who struggle to find their own voices in a traditional world. 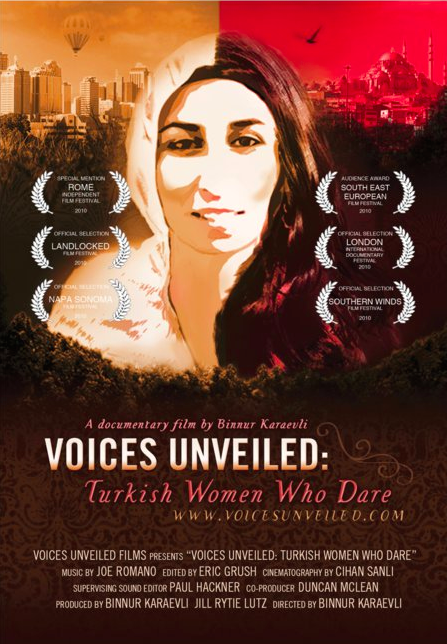 Voices Unveiled: Turkish Women Who Dare is an intimate, feature-length documentary that explores the clash of Islam and the West through the lives of three modern Turkish women - a dancer, an artist, and an activist – who struggle to find their own voices in a traditional world. Situated between Europe and Asia and bordering Iraq, Turkey is the only functioning democracy in the region. But even Turkey has a long way to go before its women are completely emancipated. Can Islamic values co-exist with gender equality among others? And would mainstream Turkish society welcome this change? Voices Unveiled examines these timely issues through the challenges the three women face. Belkis, Nur and Banu contradict the familiar stereotypes of "Muslim Middle Eastern Women." Courageous, sharp-witted, and often provocative, they are not afraid to weigh in with opinions on religion, politics, men, and gender roles. All three women continually push the envelope to live authentic lives in a culture where many women are restricted by the demands of tradition. Nur received her MBA from University of Illinois and now works as a feminist activist. Belkis, a textile artist, was a museum curator for years and Banu is studying for her Master's degree in Psychology. Belkis and Nur have built illustrious careers and overcame the conflict between their Western education, their family traditions and societal demands. In private, Belkis and Nur air their frustrations with the patriarchal traditions and encourage the younger generations of which Banu is a member, to be less burdened by dictates of tradition. Even though the characters are Turkish and Muslim, their struggle for personal empowerment is a theme to which everyone can relate. Voices Unveiled journeys with these women as they continually push the envelope to create change in their own lives and their communities. Voices Unveiled screened at a benefit for the Izmir-Long Beach Sister Cities Association (izmirlb.org) and The Turkish Women’s Initiative (thetwi.org). An educational screening of the film was held at Robert College High School after which Turkish students discussed gender inequality and struggles that women face in Turkey. The Global Women’s Leadership Network and the Turkish Women’s Initiative-sponsored private screening was a hit with the audience and generated a vibrant post-screening discussion on women’s issues in Turkey.